Before I know it Easter will be here. 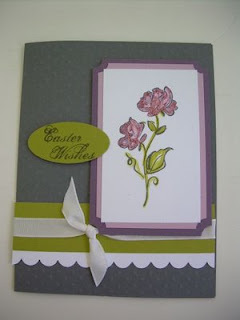 Although I don't send many Easter cards there are a few people I that I always want to send Easter Wishes to. The Echo's of Kindness is one of the Level 3 hostess sets in the current catalog. There are only four days remaining for Sale-a-Bration. Becoming a demonstrator promotion for 169.00 will also end. Along with the additional free stamp set and being able to pay in 3 equal installments. Happy Stamping !